BUS-43, Materiel Management - Employee-Vendor Relationships, Section III, Part 5 & Section IV, Part 5. University policies on the retention of independent contractors for personal or professional services are provided in UC Business and Finance Bulletin BUS-77. When departments choose to retain an individual for services other than through normal employment procedures, they must ensure that no employer-employee relationship will exist with that individual (see BUS-43, Section III, Part 5 & Section IV, Part 5). Persons from outside temporary employment agencies do not have an empoyer-employee relationship if they comply with IRS guidelines and the primary relationship is with the agency rather than the individual (see Section 300-12). The criteria used to determine a worker's status under Internal Revenue Service (IRS) common law standards and details of the penalties imposed by the IRS for the misclassification of workers are summarized in BUS-77. A compilation of relevant IRS rulings are provided to help in determining a worker's status. An Independent Contractor Pre-Hire Worksheet (available in BUS-77) may be used to ensure that a worker is properly classified. 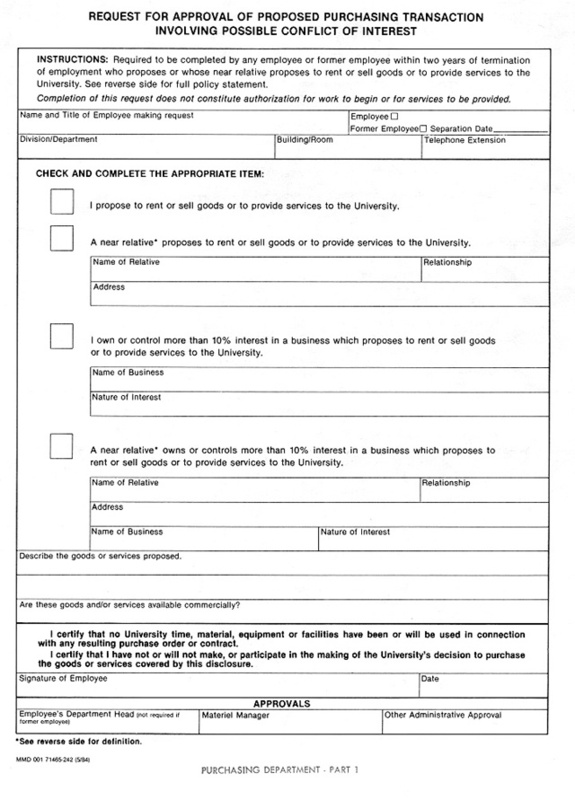 A approved agreement or purchase order must be in place PRIOR to committing University funds. Name and social security number of individual performing the service. Whether the individual is an alien and, if so, the individual's visa type. Whether University supplies or equipment will be used. Amount of payment and method of computation; i.e., by the hour, day, or job. *When applicable, attach the Request for Approval of Proposed Purchasing Transaction Involving Possible Conflict of Interest form (page 1) on which employee-vendor relationships are defined (page 2). This form, which may be obtained from Purchasing, should contain a complete justification.